German historian and Talmudic lexicographer; flourished in the second half of the twelfth century. Judah came from one of the most celebrated Jewish families of Germany. Kalonymus, Judah's father, was a scholar, an elder in Speyer, and respected at court. He was taught by his great-uncle Abraham b. Samuel, by Judah (the brother of the pious Shemarjah b. Mordecai), and by his uncle Moses b. Meïr (of whom nothing more is known). 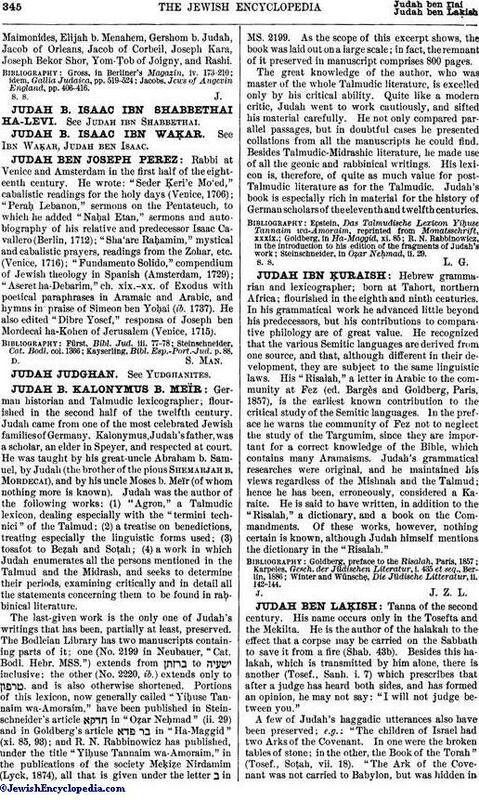 Judah was the author of the following works: (1) "Agron," a Talmudic lexicon, dealing especially with the "termini technici" of the Talmud; (2) a treatise on benedictions, treating especially the linguistic forms used; (3) tosafot to Beẓah and Soṭah; (4) a work in which Judah enumerates all the persons mentioned in the Talmud and the Midrash, and seeks to determine their periods, examining critically and in detail all the statements concerning them to be found in rabbinical literature. The last-given work is the only one of Judah's writings that has been, partially at least, preserved. The Bodleian Library has two manuscripts containing parts of it; one (No. 2199 in Neubauer, "Cat. Bodl. Hebr. MSS.") extends from to inclusive; the other (No. 2220, ib.) extends only to , and is also otherwise shortened. Portions of this lexicon, now generally called "Yiḥuse Tannaim wa-Amoraim," have been published in Steinschneider's article in "Oẓar Neḥmad" (ii. 29) and in Goldberg's article in "Ha-Maggid" (xi. 85, 93); and R. N. Rabbinowicz has published, under the title "Yiḥuse Tannaim wa-Amoraim," in the publications of the society Meḳiẓe Nirdamim (Lyck, 1874), all that is given under the letter ב in MS. 2199. As the scope of this excerpt shows, the book was laid out on a large scale; in fact, the remnant of it preserved in manuscript comprises 800 pages. The great knowledge of the author, who was master of the whole Talmudic literature, is excelled only by his critical ability. Quite like a modern critic, Judah went to work cautiously, and sifted his material carefully. He not only compared parallel passages, but in doubtful cases he presented collations from all the manuscripts he could find. Besides Talmudic-Midrashic literature, he made use of all the geonic and rabbinical writings. His lexicon is, therefore, of quite as much value for post-Talmudic literature as for the Talmudic. Judah's book is especially rich in material for the history of German scholars of the eleventh and twelfth centuries. Steinschneider, in Oẓar Neḥmad, ii. 29.